The DJI Mavic 2 Zoom Standard Day Filter Kit from Freewell Gear is an excellent way to capture cinema-quality aerial footage. The filters in this kit are designed to help you get the best quality footage from your aerial videography sessions, in normal daylight conditions. Professional aerial cinematographers will find the Freewell Gear DJI Mavic 2 Zoom Standard Day Filter Kit to be a necessary addition to their list of basic photography equipment. 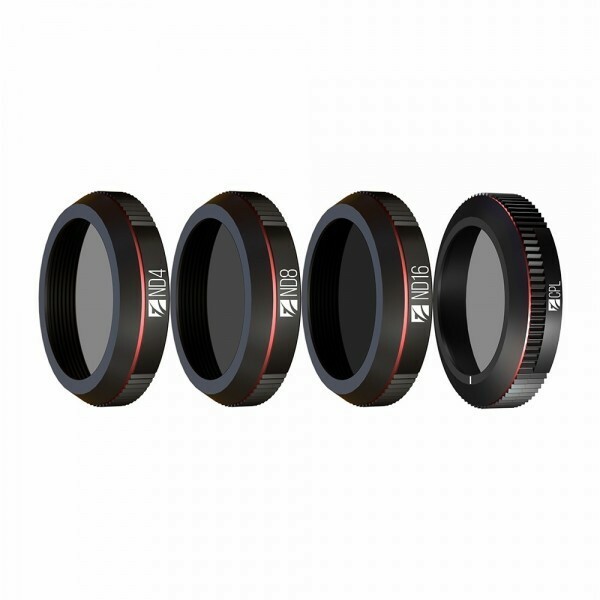 The Standard Day Filter Kit for DJI Mavic 2 Zoom contains the four essential filters (ND4, ND8, ND16 and CPL filters) which are designed to help you capture crystal-clear aerial images in sunny to cloudy daytime conditions outdoor. The three ND (Neutral Density) filters in this kit are designed to slow down the camera shutter speed successively, by 2 f-stops. This restricts the amount of light hitting the camera sensor. This is very important to capture the much sought-after ‘blur’ motion which is typical of cinematic footages. The CPL (Circular Polarized Lens) filter from Freewell Gear is designed to eliminate the unwanted glare from natural reflective surfaces commonly seen outdoors, such as glass window panes, snow and water bodies. Together, these filters help to capture the clearest and sharpest image, with a natural blurry motion to moving objects in your footage. The Freewell Gear DJI Mavic 2 Zoom Standard Day Filter Kit is truly an essential part of a professional aerial photographer’s accessories collection. Mavic 2 Zoom ND4 filter – The ND4 filter for DJI Mavic 2 Zoom from Freewell Gear helps to slow down the shutter speed by 2 f-stops. This is excellent for capturing crystal-clear photographs when the weather is overcast or fairly cloudy, with lower daylight. Mavic 2 Zoom ND8 filter – The Freewell Gear ND8 filter for DJI Mavic 2 Zoom is designed to reduce the amount of light hitting the camera sensor, which slows down the camera’s shutter speed by 3 f-stops. This is extremely helpful in capturing realistic and sharp images, especially in cloudy daylight conditions. Mavic 2 Zoom ND16 filter – The DJI Mavic 2 Zoom ND16 filter from Freewell Gear decreases the amount of light entering the drone camera lens by 4 f-stops. This is helpful in balancing the image perfectly and capturing sharp footage in normal daylight conditions. Apart from slowing down your shutter speed, the ND filters are also effective in avoiding the unwanted ‘jell-o’ effect which is often seen in footages captured without ND filters. Mavic 2 Zoom CPL (Circular Polarized Lens) filter – The CPL filter from Freewell Gear for DJI Mavic 2 Zoom is excellent in preventing the unwanted glare from reflective surfaces, such as water bodies, snow or even glass windows, when flying outdoors. The Freewell Gear DJI Mavic 2 Zoom Standard Day Filter Kit is designed to improve your videos, as well as widen your photography prospects. DJI Mavic 2 Zoom is one of the most popular drone models from the China-based drone makers. Having received rave reviews for its excellent 1” CMOS Hasselblad camera with an advanced 24-48 mm equivalent to 2x zoom feature, the Mavic 2 Zoom is the top preference of professional aerial videographers. The Freewell Gear filters designed for Mavic 2 Zoom are aimed at enhancing the cinematography capabilities of the impressive camera. With the Freewell Gear DJI Mavic 2 Zoom Standard Day Filter Kit, you can capture stunning, cinematic shots easily. Freewell Gear has been the pioneer of several drone accessories, including the ND1000, ND2000 and IR/ND filters, which were the first ever in the industry. Many competitors have been attempting to imitate our original quality however the advanced technology of Freewell has only been imitated, but never replicated to perfection. With the Freewell Gear DJI Mavic 2 Zoom Standard Day Filter Kit, you can capture stunning, cinematic shots easily.